Happy Valentine’s Day everyone! I hope you are all off to have a fun time exchanging Valentine’s Cards with friends and loved ones! 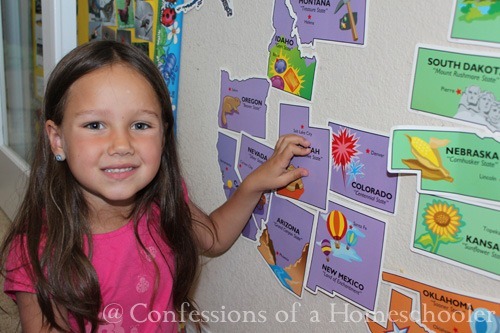 Over here are Confessions, we’re starting our day with school then heading out for a party. But before we do that, we’re taking a quick jaunt over to Utah via our Road Trip USA Geography Curriculum! 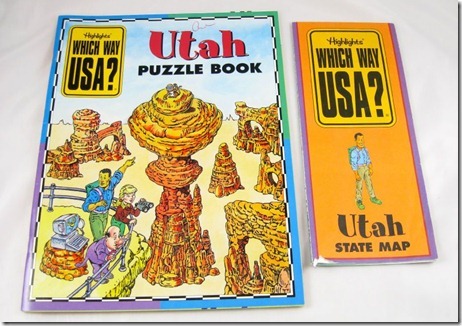 Utah became the 45th state on January 4, 1896. It is nicknamed “The Beehive State” in reference to early Mormon settlers who were described as having carried “swarms of bees” with them. Thus the nickname commemorates the industry of the people of Utah. Utah is known for it’s Great Salt Lake which has no outlets. This means that dissolved minerals carried into the lake by rivers and streams are trapped there making the lake extremely salty. (Almost seven times as salty as the world’s oceans.) 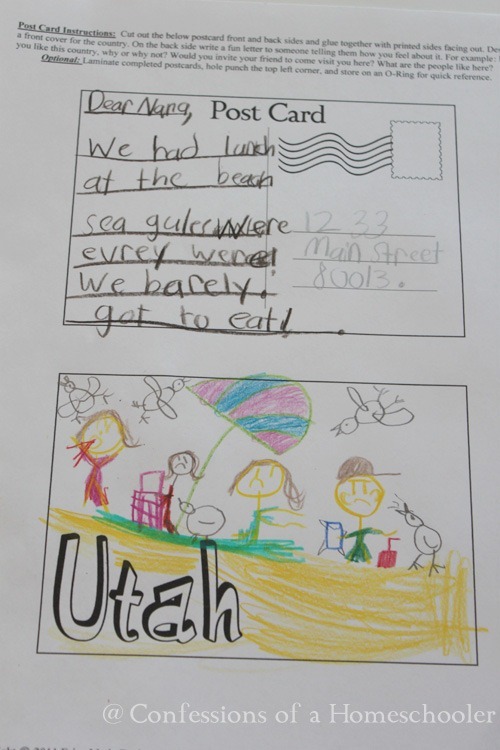 Only brine shrimp and algae are able to live in the Great Salt Lake. 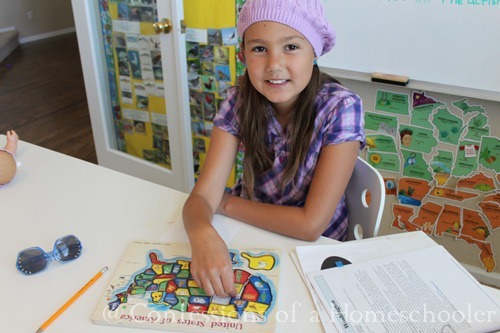 Read our National Geographic Atlas and located Salt Lake City, Utah using the map coordinates. 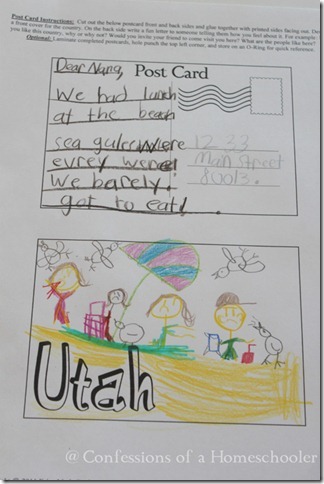 We made designed a postcard from Utah, and wrote a fictitious letter to a friend. This time I had Strawberry Shortcake make up an address so I didn’t have to gray it out. Robert Leroy Parker, a.k.a. “Butch Cassidy”, was born in Beaver, UT in 1866. He was a notorious American train robber, bank robber, and leader of the Wild Bunch Gang in the American Old West. 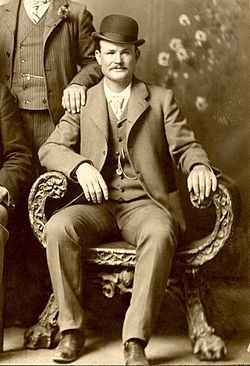 Cassidy and his partner, “Sundance Kid” were pursued by authorities, then supposedly left to Bolivia to enjoy their winnings. They were supposedly killed by Bolivian police. 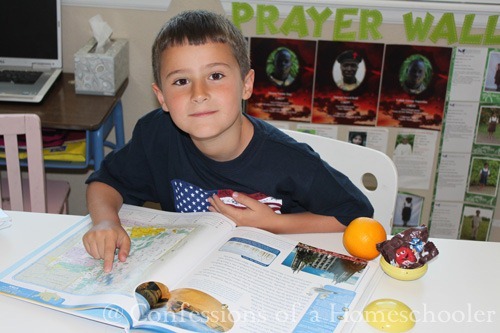 We read through all of the fun facts on Utah from our Which Way USA Highlights Subscription. If you can, this is a really fun United States subscription. 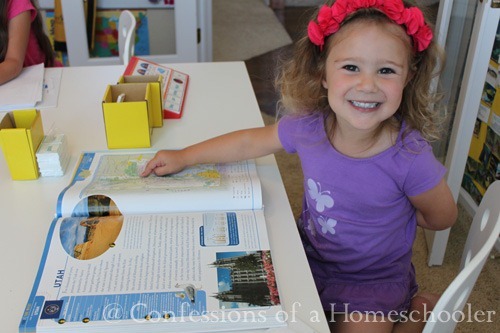 The magazines have fun games, and the fold out you see below has pictures with lots of fun facts along with a full sized map of the state on the other side. 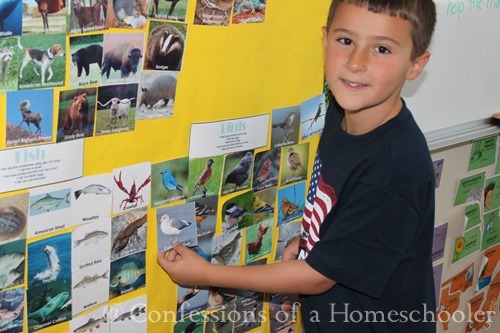 After learning about the animals symbols for Utah, we classified and added the animals to our USA animal wall! Arches National Park is a visually impressive sandstone park located just outside of Moab, UT. It is 119 square miles in size and 5,653 feet high at the top of Elephant Butte. 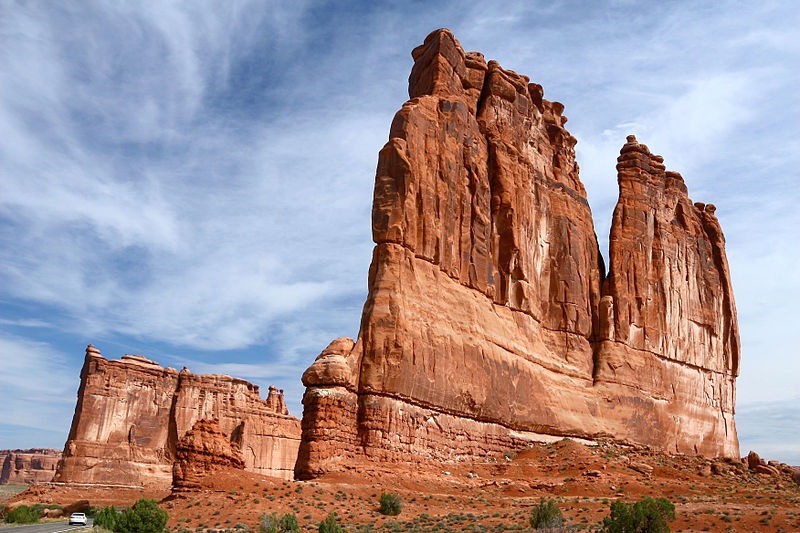 The park lies atop an underground evaporate layer of salt bed, which is the main cause of the formation of the arches, spires, and balanced rocks in the area. 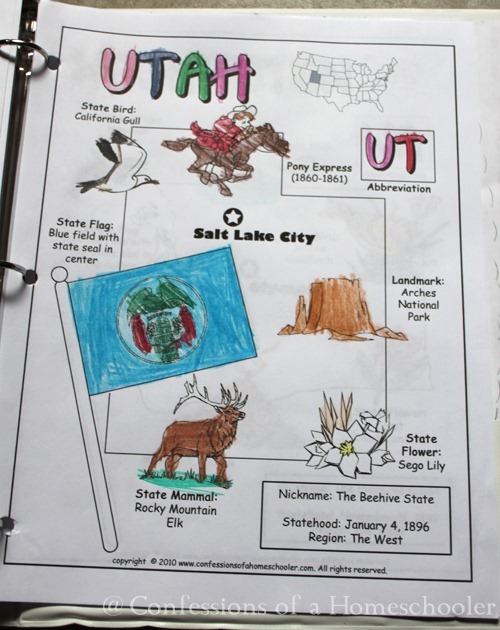 Tinker Bell added Utah to our United States Bulletin. 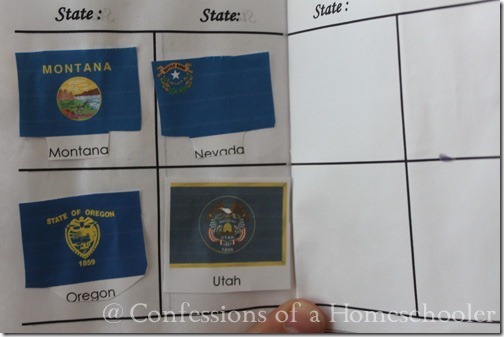 After that we reviewed all of the states we’ve learned so far on our travels. 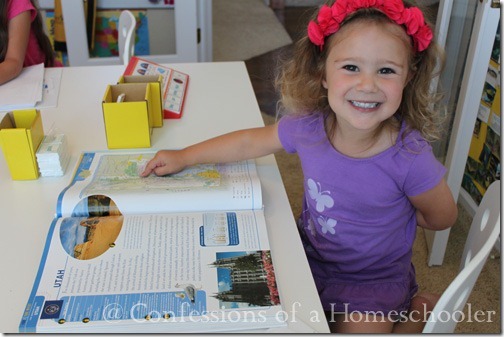 We took turns locating Salt Lake City, Utah in our National Geographic Atlas. The Teeny Tot insisted on having a turn. 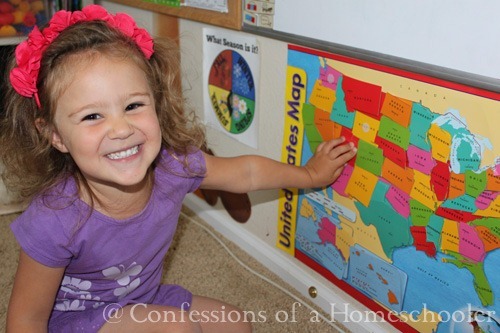 I have no clue what she’s pointing at, but clearly she was thrilled with herself for getting to do it too. Strawberry Shortcake worked on a wooden United States puzzle that we had for fun. I couldn’t find the exact one because it’s fairly old, but here is a similar United States Puzzle. Temple Square is a 10 acre complex owned by the LDS Church. 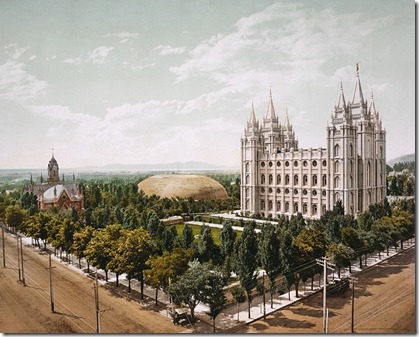 It is located in the center of Salt Lake City, UT. 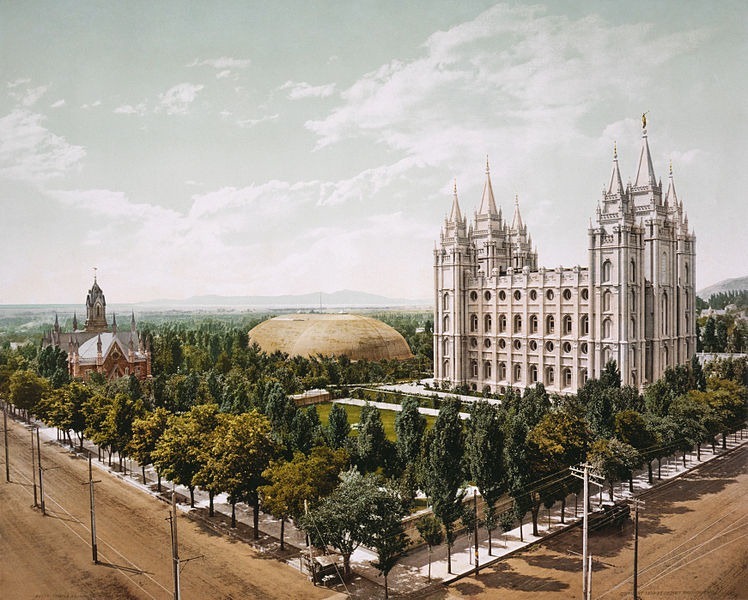 In 1847, when Mormon pioneers arrived in the Salt Lake Valley, church president Brigham Young selected a plot of ground to build a temple on. The site attracts 3-5 million visitors a year and is the most popular tourist attraction in Utah. 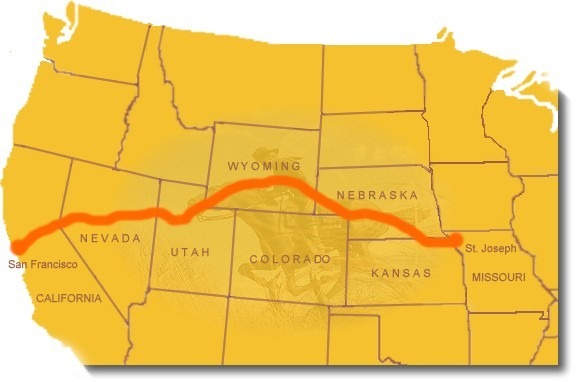 The Pony Express was a mail service crossing the Great Plains and the Rocky Mountains, the trail went from St. Joseph Missouri to Sacramento CA. 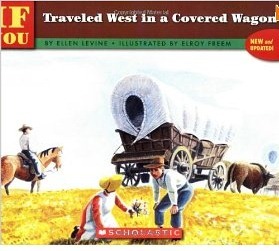 It was used between 1860 and 1861 and was the west’s most direct means of communication with the east. The Pony Express was vital for tying California with the Union just before the American Civil War. Mail was carried by horseback riders from one location to the other. The 1900 mile route followed the Oregon Trail, the California Trail to Fort Bridger in Wyoming and then the Mormon Trail into Salt lake City, Utah. From there it followed the Central Nevada Route to Carson City, NV then passed over the Sierras into Sacramento, CA. 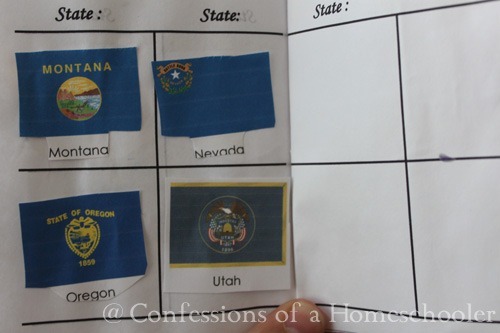 Finally we concluded our week by adding the Utah state flag to our Travel Log. And that wraps up our Utah study! If you’d like to come along with us on our Road Trip USA journey, click the image below to learn more! You know, I have received a number of the Highlights promotional packages and thought the Which Way US States supplies looked really neat, but have not taken the plunge. So you like it, huh? I am more interested now! The Road Trip USA looks fantastic!!! I have a Senior a 7th grader and 1st grader. Do you think my youngest 2 can do this together? I am doing Road Trip USA with my daughter next year who will be in 1st grade. I LOVE your resources!! 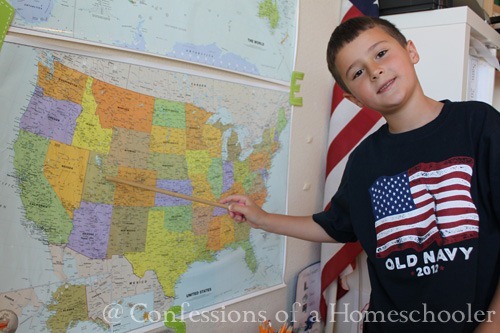 I have Road Trip USA and constantly use your prek stuff too! Thank you so much for sharing. 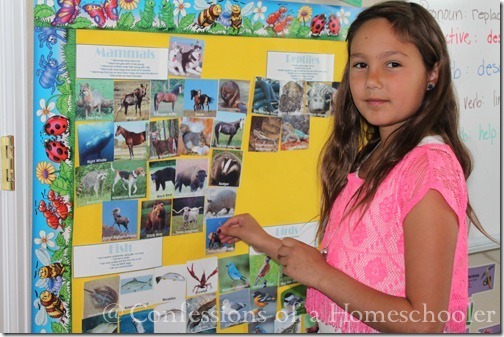 I really like the idea of the animal wall and the large US where you add the states you have traveled. 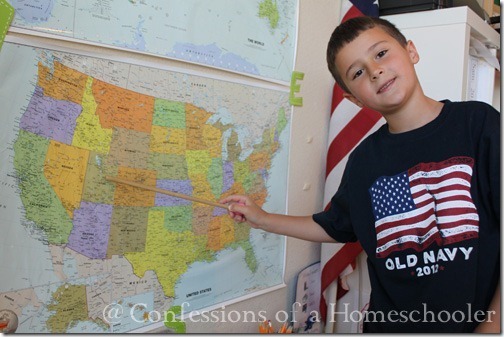 I was wondering how much time you spend on each state? I am very impressed with Road Trip USA after seeing all the fun that you post. This has made my list of curriculum to use next year with my soon to be 5th and 2nd grader. I just hope I can accomplish a great set up like you have for it! Thanks for all the great information and photos on this! 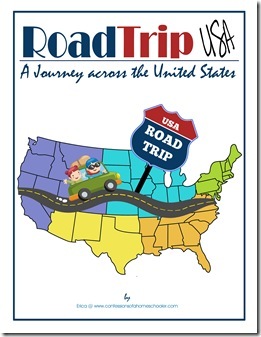 Not sure when I’ll be starting Road Trip USA (already have it from the wonderful ebook bundle! 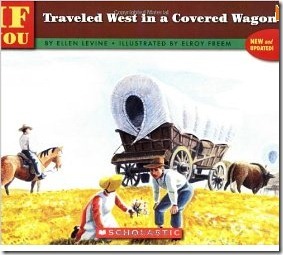 ), but I do know I’d love to the Highlights magazine with it. Looking on their website I can’t find the answer to my question so hoping you can tell me. Do they let you know in advance what states will be sent?